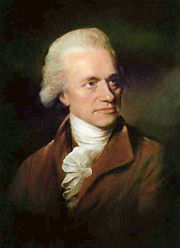 Sir Frederick William Herschel, FRS KH (November 15, 1738 - August 25, 1822) was a German-born British astronomer and composer who became famous for discovering the planet Uranus. He also discovered infrared radiation and made many other discoveries in astronomy. 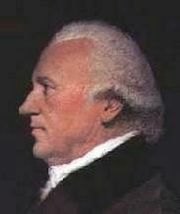 Born Friedrich Wilhelm Herschel in Hanover, Germany, Herschel was one of ten children (of whom four died very young), of Isaac Herschel and Anna Ilse Moritzen. William’s father taught music, and was a member, and later, the bandmaster, of the band of the Hanoverian guard. William and another son, Jacob, also played in the band, which in 1755 was ordered to England. At the time, the crowns of England and Hanover were united under George II. Herschel learned English quickly and, at age 19, his father sent him to Dover, England, to avoid military service. Herschel then changed his first and second names to the anglicized "Frederick William." After three years of struggle in England, Herschel managed to find work as a music teacher and bandleader. Herschel played the violin, the oboe and, later, the organ. He composed numerous musical works, including 24 symphonies and many concertos, as well as some church music. His music is largely forgotten today. After a career leading orchestras in Newcastle, Leeds, and Halifax (he was organist at the Parish Church of St John the Baptist, Halifax, West Yorkshire), he became organist of the Octagon Chapel, Bath, in which town he was also Director of Public Concerts. His sister Caroline came to England and lived with him in New King Street. His brothers Dietrich, Alexander and Jacob also appeared as musicians in Bath. Herschel's music led him to an interest in mathematics, and hence to astronomy. This interest grew stronger after 1773, when he built his first telescope. He then went on to build larger instruments to improve his observational capacity, and began surveying the stars. The turning point in Herschel's life was March 13, 1781, while he was living at 19 New King Street, Bath, when he made the first sighting of the planet Uranus. Herschel originally believed it to be a comet, but upon informing the Astronomer Royal, Nevil Maskelyne, the later intimated that the object might be a planet, a hunch that was later confirmed. This discovery made Herschel famous and enabled him to turn to astronomy full-time. Naming the new planet Georgium Sidus, Latin for "George's Star," in honor of King George III also brought him favor (the name was not generally popular; in France, where reference to the English king was to be avoided if possible, the planet was known as 'Herschel' until the name 'Uranus' was universally adopted). That same year, Herschel was awarded the Copley Medal and was elected a Fellow of the Royal Society. In 1782, he met personally with King George III, who absolved him of potential charges of desertion from the military acquired in his youth, and appointed him "The King’s Astronomer." This honor came with a stipend of 200 pounds a year. Herschel and Caroline subsequently moved to Datchet (then in Buckinghamshire but now in Berkshire) on August 1, 1782. He continued his work as a telescope maker, selling a large number of instruments to astronomers and to the royal family. In 1783, he gave Caroline a telescope and she began to make astronomical discoveries in her own right, particularly comets. Caroline also served as Herschel’s full-time assistant, taking notes while he observed at the telescope. In June 1785, owing to damp conditions, he and Caroline moved to Clay Hall in Old Windsor. On April 3, 1786, they moved again to a new residence on Windsor Road in Slough. He lived the rest of his life in this residence, which came to be known as Observatory House. It is no longer standing, having been demolished in 1963 to make way for a high-rise office building. On May 7, 1788, he married the widow Mary Pitt (née Baldwin) at St Laurence's Church, Upton in Slough. His sister Caroline then moved to separate lodgings, but continued to work as his assistant. During the course of his career, Herschel constructed more than 400 telescopes. The largest and most famous of these was a reflecting telescope with a 40 ft (12 m) focal length and an aperture 49½ inches (126 cm) in diameter. This telescope, which took several years to complete, employed an optical arrangement now known as the Herschelian where the light reflected from the telescope mirror goes directly to the eyepiece, instead of being reflected to the side by a small mirror as in previous designs. This conserves the intensity of the light, and makes the telescope more powerful. On August 28, 1789, his first night of observation using this instrument, he discovered a new moon of Saturn. A second moon followed within the first month of observation. 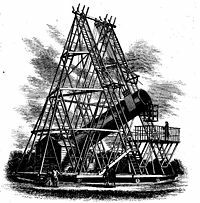 The 40 ft telescope proved very cumbersome, however, and most of his observations were done with a smaller telescope of 20 ft (6.1 m) focal length. William and Mary had one child, John, born at Observatory House on March 7, 1792. In 1816, William was made a Knight of the Royal Guelphic Order by the Prince Regent entitling him to the prefix 'Sir'. He helped to found the Astronomical Society of London in 1820, which in 1831 received a royal charter and became the Royal Astronomical Society. On August 25, 1822, Herschel died at Observatory House, Slough, at the age of 84, and is buried at nearby St Laurence's Church, Upton. His son John Herschel also became a famous astronomer. One of William's brothers, Alexander, moved permanently to England, near Caroline and William. His house in Bath, where he made many telescopes and first observed Uranus, is now home to the William Herschel Museum. In 1787, Herschel discovered two satellites of Uranus, Oberon, and Titania. Herschel worked on creating an extensive catalog of nebulae and double stars, the first of these being published in 1782. He orignally tracked double stars in the hope that they would provide a clue to stellar distances through a comparison of the the stellar luminosities of each pair, provided that their closeness was simply a matter of chance, one of the stars being in reality much more distant than the other. In 1803, however, he announced his conclusion that most double stars are not mere optical doubles as had been supposed previously, but are true binary stars held together by mutual attraction, thus providing the first proof that Newton's laws of gravitation apply outside the solar system. Herschel also studied variable stars, which fluctuate in luminosity. In one of the most remarkable and far-reaching discoveries of the nineteenth century, Herschel in 1800 reported the discovery of infrared radiation by passing sunlight through a prism and holding a thermometer just beyond the red end of the visible spectrum. This thermometer was meant to be a "control" to measure the ambient air temperature in the room. He was shocked when it showed a higher temperature than the visible spectrum. Further experimentation led to Herschel's conclusion that there must be an invisible form of light beyond the visible spectrum, and that this form of radiation transmits heat. From studying the proper motion of stars, he was the first to realize that the solar system is moving through space, and he determined the approximate direction of that movement (toward the constellation Hercules). He also studied the structure of the Milky Way and concluded that it was in the shape of a disk. He also coined the word "asteroid," meaning star-like (from the Greek asteroeides, aster "star" + -eidos "form, shape"), in 1802 (shortly after Olbers discovered the second minor planet, 2 Pallas, in late March of the same year), to describe the star-like appearance of the small moons of the giant planets and of the minor planets; the planets all show discs, by comparison. Despite his numerous important scientific discoveries, Herschel was not averse to wild speculation. In particular, he believed every planet was inhabited, even the Sun: he believed that the Sun had a cool, solid surface protected from its hot atmosphere by an opaque layer of cloud, and that a race of beings adapted to their strange environment lived there that had enormous heads. Herschel made a few other miscalculations in in his career. He tried to estimate stellar distances based on the assumption that stars are roughly the same size and type as the sun and by comparing the luminosity of each. This assumption proved to be faulty. He also assumed that nebulae were all composed of individual stars, which would be revealed as the resolution of telescopes improved. He eventually corrected this misconception. Herschel also reported the existence of four additional satellites of Uranus that could not be confirmed by others. And he reported volcanic activity on the moon that no astronomer has seen since. Rue Herschel a street in Paris, France bears his name. The Herschel Observatory, from the school Universitas in Santos, Brazil. ↑ Rue Herschel, Google, 2008. Retrieved March 13, 2008. ↑ Herschel School, Herschel Girls School, 2008. Retrieved March 13, 2008. ↑ Herschelschule, SchulCMS, 2007. Retrieved March 13, 2008. ↑ Ancient Echoes Interpretive Centre, Gaucho Conception, 2007. Retrieved March 13, 2008. All links retrieved February 20, 2014. This page was last modified on 20 February 2014, at 16:27.